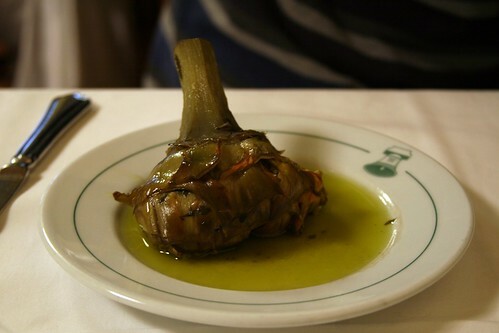 Carciofo alla romana, artichoke braised with oil and herbs, is a winter and spring dish. Visitors to Rome have long understood that among the city’s highlights, ranking right up there with the Pantheon or the Colosseum, are its typical dishes. Some are seasonal (carciofi alla giudia, pizza con prosciutto e fichi), others are not (spaghetti alla gricia, trippa alla romana), still others could go either way (some fritti are, some are not). With all this variety and seasonality on its side, Rome appears strongly rooted in tradition, impervious to change. But with roughly 9 million visitors annually and nearly 4 million residents in the metropolitan area, the city and its customs are threatened every day. Consumers demand out of season dishes, leading restaurants to serve them. Residents demand value and convenience, spurring the rise of supermarkets. Throw in globalization, a corrupt Minister of Agriculture, a farming crisis, and a shift in local food sensibilities, and Rome’s gastronomic future is in serious trouble. If you are staying at a hotel, purchase your provisions at an alimentari (deli). If you are staying at a self-catering apartment, pick up your bread at the bakery, meat at the butcher, and produce at the produce market. Patronizing small local businesses will keep them alive as Despar, GS, Sma and other supermarkets exert their influence. Aside from the unfortunate presence of The Hard Rock Cafe, McDonalds, and Burger King, Rome has been rather resistant to American culinary imperialism. However, there are still a number of Italian chains operating in the center like the tragic Blue Ice gelateria, and Spizzico on the Via del Corso. They offer bad product made with terrible ingredients, chemical colorings, and preservatives. The Autogrill on major Italian roadways and food service at rail stations and on the trains themselves are also run by large corporations. Avoid! Prepare for a road trip or train travel by picking up some fresh sandwiches made at a locally owned alimentari. Frequent restaurants that source locally. In the past few years, a growing number of restaurants have been dedicated to using local products, from produce and olive oil to meat and cheese. Checchino dal 1887 (Via di Monte Testaccio, 30) and Palatium (via Frattina 94) have been at this for years, and now many other places are doing it, too. 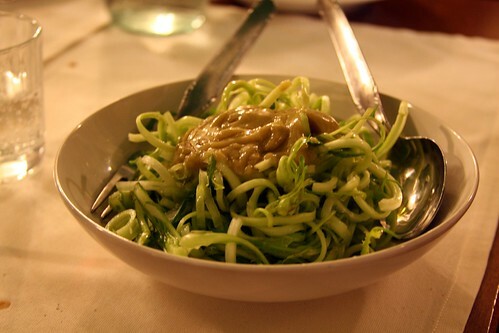 Back in June, I wrote this piece for the New York Times on locavore dining in Rome. In addition to the places mentioned in the article, the restaurant at Citta’ dell’Altra Economia in Testaccio also serves food prepared with locally sourced ingredients. The RSFP garden at the American Academy in Rome. Get involved with the Rome Sustainable Food Project. The Rome Sustainable Food Project, based at the American Academy in Rome on the Janiculum Hill, is a joint venture between the AAR and Alice Waters that uses fresh, seasonal, organic products to create nourishing meals for the Academy’s fellows and visiting scholars. A 50 euro donation to the Friends of the American Academy in Italy gives you the opportunity to have lunch at the AAR with up to 10 guests. Become a friend here. Just because you want a deep fried artichoke doesn’t mean you get to have it. I recently got into this discussion on the Chowhound Italy board when I castigated someone for ordering carciofi alla giudia at Sora Margherita (one of the worst places around, by the way) in July. Another reader came to the offender’s rescue, stating, “For those of us who are not in Rome year-round, the production of fried artichokes out of season even if from non-local artichokes is appreciated”. This statement is wrong on so many levels. If you don’t know when Roman artichokes are in season (February-May), that’s one thing (see next tip), but if you knowingly order out of season dishes, you are being an irresponsible food tourist. Creating demand for out of season produce has significant ramifications, both for the local culture, as well as for the environment. If you must have a deep fried treat from the Roman Jewish tradition in July, pass on the carciofo alla giudia and indulge in fiori di zucca! With Rome’s incredible biodiversity, it may seem intimidating to learn when each fruit and vegetable is in season. To make the process easier, take a spin in a produce market (Testaccio, San Giovanni di Dio, or Citta’ dell’Altra Economia; NOT Campo de’ Fiori which is one of the worst places on earth to see what’s local or seasonal). Farmers markets like the Mercato di Campagna Amica del Circo Massimo (on hiatus until September) and the Roma Farmer’s Market in the ex-Mattatoio are other destinations for finding what’s local and in season. 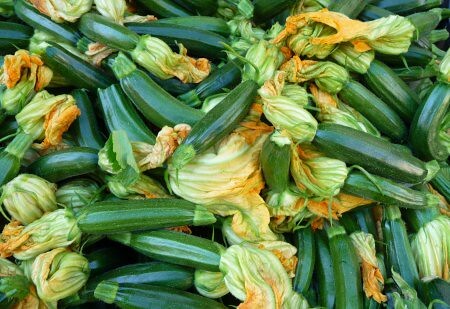 Summer zucchini at a Roman market. These tips should get you started on responsible food tourism in Rome, but they are equally valid for other cities. Let me know your thoughts and if I have missed anything! What a thooughtful posting, Katie.Wish you would develop it for the Times so others will think about what you are advocating. Here in the States, eating only foods in season is talked about but not many walk the walk. And as for supporting local stores, vs. supermarkets, well, you know where the harried middle class shops. Your posts and pictures always make me hungry! Just remembered that a local Albany food group sends out a veggie truck to poor neighborhoods in summer so that those without cars and far from supermarkets can benefit from homegrown food from community gardens. I don’t understand why someone would want to eat something out of season. The quality is not going to be good. I feel it’s much easier here than in the States to support small, local, shops, butchers, etc. We are surrounded by them. I thought you liked Sora Margherita. I’ve only been there once and my lunch was very, very good. Then again it would have been kind of hard to mess up my pasta dish. I am so with you! I so often have guests who hear it for the first time from me that there is a specific season for a specific vegetable or fruit or fish… And even people who live here! There is so much work to do! But if we could even bring expats and Romans to stick to these rules, that would be a great start. How bout “learn the dishes”? Am so sick of people telling me about “the lovely” pappardelle with wild boar or the bistecca fiorentina or the safran risotto they had the night before. You are here for 3 days (the official average stay of Roman tourists), surely you can eat Roman food during that time! Re: AA (apart from the fact that it always makes my browser crash) – are you 100% positive “A 50 euro donation to the Friends of the American Academy in Italy gives you the opportunity to have lunch at the AAR with up to 10 guests”? I had considered becoming a friend, but have never seen this specific info; that would surely be a deal-maker for me. this is a brilliant piece! i always shop at local food stores and look forward to the veggies that come into season at my local greengrocer – agretti (monk’s beard) and black cabbage, for example, taste all the better because i know i won’t be able to eat them all year round! Brava Katie, thank you for this engaing and informative piece. Katie, what a great article, wish everyone whethr traveling abroad or staying home would think about this. As a member of Slow Food San Francisco this is on our radar here and I thank you for putting it out there…as Ann said please develop this for the NYTimes. I have a home in Nettuno not far from you in Rome and have noticed a tragic decline in privately owned food stores (frutterie, macellerie, etc. ) as PAM and others moved in…I hope more Italians read your aticle as well! Katie, i enjoyed reading your piece and i agree with a lot of things you have written. one should definitely avoid the chains, however, i can remember myself traveling to different cities as a child with my parents, two younger sisters in tow-sometimes it is just a matter of convenience, one does not end up going to the markets as one should bec it’s easier to go to a supermarket with your kids screaming in the background! Thanks so much Katie for the shout out for the Friends of the Academy in Italy! Yes, Hande, you do get to eat lunch there! So join up. Regarding carciofi…yes, they are at their best when in season and local. But some of the best places to have them in Rome bridge the season with artichokes brought in from France. Not the same, but not bad. And as far as not eating risotto in Rome….really? Are we not supposed to eat risotto in New York either? I’m all for eating locally, when possible, but I think you have to cut tourist a little slack. Also, does that mean we all have to eat Roman dishes all the time? And for the record, I think the world would be a much sadder place without Autogrills. Such an excellent post Katie! Being raised in Oregon, and developing my palate in Portland, eating locally and seasonally are ideals that are very near and dear to my heart. it is also one of the reasons why I fell in love with Italy. I certainly hope the NYT picks this up! Because I wrote my comment in a hurry, I wasn’t too clear, I can see now. Of course I don’t mean we shouldn’t be eating anything else here. But I am more for eating the safron risotto (please note I specified my risotto!) in a trattoria that specializes in Lombardy food, and does those dishes good. Just like I’d love to have a really good hamburger or good Vietnam or good whatever food in a place that is specialized in that and does it good. And expect the majority of the restaurants in Rome to offer Roman/Lazio food. What I am against is these nondescript places that offer everything, from all regions, over 100 dishes, cementing the blurry notion of “italian food” in the minds of tourists whereas Italy is actually a haven of regional dishes. That was what I meant! @Hande- you are right , i suppose the onus is on the restaurants, too, right? foodies like you, myself, Katie, we love all these regional cuisines, but a lot of tourists, including my parents, dont know much about regional specialties. perhaps that place in the centre should not have been serving risotto- but to be honest, it was damn good! haha. i had ‘stracetto’, by the way 😉 so i am innocent. @nyc/caribbean ragazza i do not like that place. their carciofi alla giudia are all soggy and lame. also spiney and the choke gets caught in your throat. wtf? looks like someone is using a cheaper alternative to the carciofo romanesco…i have a long list of complaints about that place but for now ill just say it’s a gimmick that tricks people into thinking they are having an “authentic” experience while charging WAY too much. @all thanks for the great comments. Im headed out to eat and will respond, wine permitting, after dinner. ciao! great article! i really want you to come with me to the Amish market in flemington when you are home. fresh rabbits, goose, suckling pigs, dozens of freshly ground sausages, seeds and grains and the list goes on. Nice article, Katie. I have been following you but haven’t been stirred to a comment for quite a while. As you can imagine, living in the middle of Alaska we have little choice in local foods, unless you eat like a bear. With information such as you have provided many travelers can learn what to look for so they can enjoy the bounties of fresh Roman agriculture. I know that I appreciate information that will lead me to the most interesting and freshest food I can find when I am in Rome. And anywhere else, for that matter. Figs? Where are the figs on the list? I adore figs… and have several pictures of meals I created and enjoyed with figs. Thanks for the listing of seasonal produce, and general guidance on how to navigate towards the seasonal and local. So much of my pleasure in (and reason for going to) a place like Rome is to experience all of this–not things I can get elsewhere. However. even as a Greenmarket regular and careful Italian-American cook who loves eating seasonally and believes in quality food for all, I can’t help but wince at the smug tone of some of your posts, and of some of the comments. I understand, and support, these goals and ideals. But to create demeaning binaries like responsible/irresponsible “tourists” or to constantly remind the rest of us that the small of group of those who (sigh) “know” need to work on those who somehow don’t–well, not a way to win friends or showcase a cause. The absolute horror of “convenience” for those not lucky enough to live near a sweet local mercatino? Those tourists just “not trying to be responsible?” Never an apple in April? Or a lemon in August? Or a Sicilian tomato? For most folks, life is making the most of compromise and shortfall. Give them reasons to consider the appeal and value of what you’re saying–not excuses to ignore you. @Debs @ Living In Rome	I know what you mean. When figs go out of season I get so depressed. Then there are kaki to cheer me up:) this goes on and on all year and it brings me real joy to welcome new fruits and veg into season as others grow out. @Carol Pan Nettuno is wonderful and so much of Lazio’s produce comes from the provincia di Latina. Im curious, are there farmer’s markets in your neck of the woods? Have Mercati di Campagna Amica sprung up? @Shayma ive read some criticism of the locavore movement because it discourages imports from developing countries (feel free to point out any inaccuracies!). I’m not against eating food that comes from foreign sources by any means. On the contrary, i am troubled by the marketing tactics used by some farmers markets here in Italy which smack of Legista nationalism, positing foreign produce as contaminated and unclean. This view is widely held among the greater population, even members AND profs of my MA course who believed produce imports were not subjected to strict regulations and controls before entering the EU. They had particular malice for Chinese imports. Id love to chat about this over a bottle of wine! @Elizabeth no we do not have to eat the cucina romana all the time. god no! in fact, i often recommend visitors to Rome check out pizza al taglio 00100 (they make a mean focaccia pugliese), Colline Emiliane, Filippo La Mantia, and other regional cuisines. I also suggest Ethiopian, which is an important ethnic cuisine present in Rome for nearly a century now. Being a responsible food tourist doesnt mean binging on carbonara and shunning everything non-roman, but it does imply learning about the local cuisine. People read up on the Forum before visiting, why not the classic dishes, too? Also, Autogrills make me sad. @Engred Nice to hear from you, as always! What a wonderful place to be raised and to develop food sensibility. I’m from the Garden State but farmers markets have only just picked up again in the past 5 years or so, even less. @papa parla Im there!!! What day is the market? @DMae Great to have you back, DMae! Bears are omnivores so, technically, I do eat like one. I tend to steer clear of raw bugs, tho:) Ill add figs to the list for you! @Robert I dont think categorizing a person as a responsible tourist, food tourist, mass tourist, irresponsible tourist, or other is demeaning. on the contrary, i think it is essential to use these labels in order to have an intelligent discussion on the topic. there is a growing number of scholarly disciplines dedicated to studying tourism styles (not trends, but approaches) and the impact of those styles on people, environment, culture, infrastructure, etc. “Responsible” and “irresponsible” tourism are terms contrasted in the discipline. i am simply employing the langues of this area of study. labeling a person or a behavior “irresponsible” is not a judgement. it is an objective assessment of a tourism approach. People who do (sigh?) “know” should share what they know. I live in Rome, work in the food/travel industry, and witness first hand the negative impacts that tourism has on this city. How could I NOT write about this? That would be irresponsible of me. I, personally, am not willing to compromise on the tenets of responsible tourism, gastronomic or otherwise. If promoting these ideas implies smugness or offends people, then im afraid they have missed the point. Thanks, Kate, verr much for your thoughtful and enlightening reply. I was probably understating the degree of my agreement with all the tenets of responsible eating, cooking, and travelling. I support them all, and fear for the viability of places and cultures I’ve held dear. I support anything that can be done to create a positive, willing, and long-term movement in support of responsibility. That said, I would only caution those in positions to influence opinions and behaviors to consider that while there are some who can be motivated by a call to a moral crusade, still others, maybe more, might not–but they can be, I think, moved by the simple realities that travelling responsibility yields so many better (more pleasurable, delicious, satisfying) results. And it helps sustain that which draws you to Italy in the first place. Rome is wonderful, but even wonderful can be better, if you know where to look and what to look for. Keep helping us index these places and things, and reminding us of the realities we face. But do know that we need you all as welcoming compatriots and colleagues, not gatekeepers, and the job ahead as a joyful adventure rather than as an impossible chore. Forza. Proselytize all you like for responsible tourism (although I also think more flies are caught with honey than with vinegar), but there is nothing to justify the elitism of self-employed expats haranguing against the rise of supermarkets. Supermarkets rose and individual butchers and bakers declined when most Italian families were forced by economic necessity to become two-earner households. To castigate supermarkets because they offer convenience to couples where both work 8-to-5 jobs is nothing short of overweening arrogance. The disappearance of the corner baker and butcher is a foregone conclusion; the survival of the Rosciolis and Annibales patronized by those with hours of leisure and incomes above those of many a two-earner Roman family is ensured, with or without self-righteous posturing. As for current irresponsible tourists arrogantly pushing the demand for out-of-season carciofi alla giudia, restaurants in the Ghetto (from Sora Margherita to Piperno) have been offering them since time immemorial. @Robert Thanks for your comments, Robert. W Garbatella! @Eloise thanks for your compliments and astute observations. I did not mean to offend your deep bond with supermarkets. As the title of my piece states, this is a post on responsible food tourism. I listed a few suggestions for how to be a responsible food tourist on holiday in Rome. I can’t imagine why an 8-5 job would be relevant. Also, I cannot fathom why shopping at bakeries, butchers, or alimentari is offensive. The trite assertion that champions the supermarket as the savior of two-earner households is a cop-out that exonerates the consumer from taking responsibility for her actions. Any perceived savings at the supermarket comes at a high cost, damaging local producers and economies, while corporations reap the benefits. Convenience is not a good enough reason to turn a blind eye to the adverse consequences of ones actions. Here is a solution that provides convenience and responsible consumption: MagiorDomus will deliver local products to your Roman doorstep by 730am, just in time to head out for that 8am job. Enjoyed the post Katie. The principles of responsible eating (and being a responsible food buyer) apply equally wherever we are, as you say. There is a delicate balance to be struck when writing about matters of ethical consumerism – step too far and it reads as patronising and arrogant. I don’t for a minute think you’ve fallen into that trap. You’ve offered sound advice that all of us can take on board. Can I argue with your advice and rationale? No, I share the same ideals. Do I follow these ideals? Sadly, I often have to balance the good of shopping in the local store where I know the owner and feel confident that he knows his suppliers, with the reality that I might only get out when the only shop open is the supermarket. Your post serves as a good reminder to readers, not just in Rome, of the value of delis and farm stores. We can all help these small businesses more than we do, and like you Katie, I’m convinced we do benefit in the longer term. Just wanted to drop a line to say how much I’ve been enjoying all of your writing- and photos. This was a great article, and I can’t wait to try some of your recommendations next time I’m in Italy (we are hoping to visit Sicily and then Istanbul next fall). When I visited a few years ago, we were able to rent small apartments in Sinalunga and Monterosso for much less than hotels would have cost. Doing so gave us the pleasure of shopping and cooking some meals from the local markets, which in turn allowed us some splurges on meals at local places. There is a growing trend back towards local food here in New Hampshire, and our new house is across from a huge organic farm that is days from harvesting its first corn- can’t wait! I must say that even with co-op membership, farmers markets and growing some of our own food, it is sometimes prohibitively expensive to buy local, especially meats and cheeses. Don’t get me wrong, I know it is worth every penny to properly support the efforts of those raising/ producing sustainable food, but sometimes it’s just more than most folks can afford. I was happy to read that finally those needing WIC/ or Food stamps here in the US can now use them at farmers markets and to buy healthier food in general. Anyway, keep up the good work. I’m following your career with excitement and envy. Maybe we can hook up next time I make it over. What a great post. With all the abundance in the Roman countryside, there really is no excuse to not eat locally or seasonally. I live in the Castelli and can promise we are drowning in summer veggies, and I would never go to the supermarket just to satisfy my desire for artichokes. I have had to switch my dogs to a vegetarian diet just to keep up with my neighbor’s gifts. It is not so hard for people to do this. I think most people just don’t spend the extra five minutes looking at a menu to make sure it is seasonal and local just out of laziness. I can promise tourists that veggies and fruits are much better when in season!! @Andy thanks for your great comments. i think we can all do better to respect the food we consume and the people who produce it. it’s a struggle and it requires sacrifices and no, it is not always possible to always shop or consume responsibly, but we need to try! @Elisabeth that is a great idea. There are so many small local producers out there it is hard to keep track sometimes. I find visiting Farmer’s Markets at the Circo Massimo, ex-Mattatoio, and Citta’ dell’Altra Economia are places to start. This post has suggestions of where to shop and some local products to look out for. And this one on the Mercato di Campagna Amica at the Circus Maximus lists some of the producers you will find there, including their websites, phone numbers, and addresses. It’s just a start and there is lots more to do. Do you have any to recommend? @Sarah May it hardly seems fair for you to leave a comment without once mentioning the mexican food you had at home! let us live vicariously! 🙂 The Castelli must be bursting with fresh fruit right now. Can’t wait to get back to Rome for the figs and grapes. What else are you all enjoying out there? Hi Katie, I know quite well Rome and I find your point of view very interesting. Writing “Respect the seasons” you gave me an idea for my blog. Thank’s a lot! Ha! Well I will say this. The night before I left San Diego I stuffed 10 potato tacos into myself with the intention of satiated taco madness for the next year. It didn’t work. I did bring some tortillas back, though. As for figs, my June figs were the best I have ever had. For the Settembrini, I have no idea what happened. They all look like raisins. My neighbors have been pushing grapes lately. they are so sweet. I did not garden this year, but after seeing what my neighbors have produced, I am excited for 2011 to begin. One of my neighbors practices synergystic(sp?) gardening, which is what I think we will do. The High Price of Low Cost. WAL-MART is evil, people. The USDA owns “organic” which is why we all need to make a point to eat locally and seasonally. Get to know where your food comes from. It is NOT difficult for the readers of this blog, I am sure. I just found your posts and found them to be very interesting. I am forwarding the link to my daughter who organized a local farmers market on her campus. Looking at your list though, it seems when I visit Rome this December I am destined to eat only black leaf kale and turnips if I am to be a responsible tourist! hi marisa! there is lots of winter produce available that is not on the list. take a spin at one of rome’s great produce markets–testaccio, san giovanni di dio and the mercato trionfale are my favorites–and you find lots more that just kale. enjoy rome! Hi Katie, you only need to take a peek at the amount of responces to see how popular this great article has been. I would classify myself as a culinary tourist and I aim to be as responcible as possible. Well said and written. I particularly agree with the writer’s invitation to buy food in local stores and not in supermarkets, and to go to restaurants where local ingredients are used. After all this has always been the priority of Italian cuisine, at all levels.